I have made these a few times and we all love these. Take a bowl and add the coconut milk, oil, vanilla and sugar and mix until combined. Next sieve the dry ingredients and add to the bowl folding until all ingredients are combined. Pour into cupcake cases and bake for about 18 to 20 minutes. Leave to cool on a rack. Sieve the icing sugar into a bowl. Gradually add the coconut milk a little at a time stirring until you get a thick icing. Ice the cakes and sprinkle with the desiccated coconut. Hi these look really yummy, and I would love to try them, but do you find that children with nut allergies react to cocoNUT? I am from the Caribbean and we use a lot of coconut cream in our cooking, but out of fear I have never offered it to my children. I have never had any problem with coconut because I was informed by my allergist that it is not actually a nut despite the name. If a person was to react to it it would be a seperate thing and not nut related was what she said. Levi has coconut in a lot of things and is always fine and his reaction to all kinds of nut is quite strong. I have a very nut allergic friend who also confirmed this about coconut as well as nutmeg which is also not a nut and Levi can also eat this. Thankyou for your comment because it is a good question to ask and I am sure many other people wonder this as well. As chocolat has histamine (which makes allergies flare up), I was wondering if it was possible to leave it out, or to replace it with something else. Thank you ! we have never experienced any problem with chocolate. My allergist said that the type of reaction caused by this is intolerance as the immune system is not involved as with true allergy ( I saw her yesterday and asked the question). 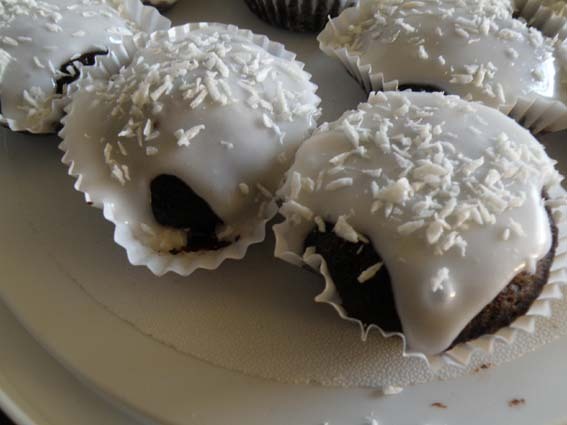 Maybe you could make just a coconut cupcake and replace with dessicated coconut? Yes, that is exactly what I did and I added more vanilla. The taste is ok for my children, but my husband thought it was a bit bland. I’ve just made these, as my first free from chocolate cupcakes, and they are delicious, I haven’t got round to the icing yet, but will ice them later. Delicious, thank you!